SMS auto follow up is a great way to educate customer, build brand awareness and customer relationship. 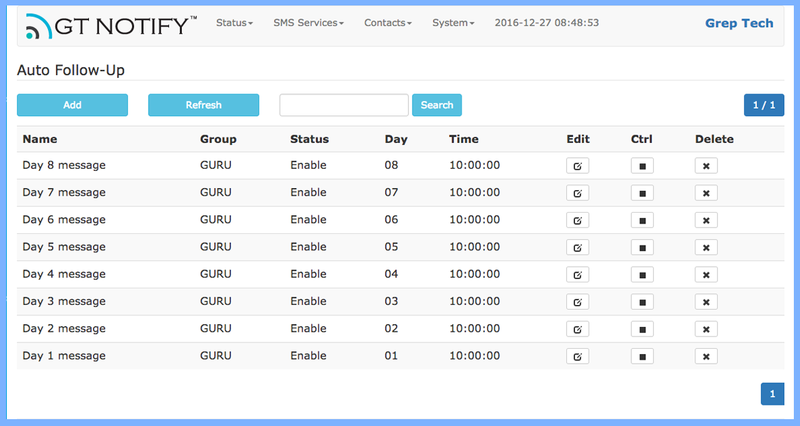 SMS auto follow up will send out pre-configured messages to the subscriber in a group in a pre-defined schedule. Like a SMS newsletter for each subscribers. 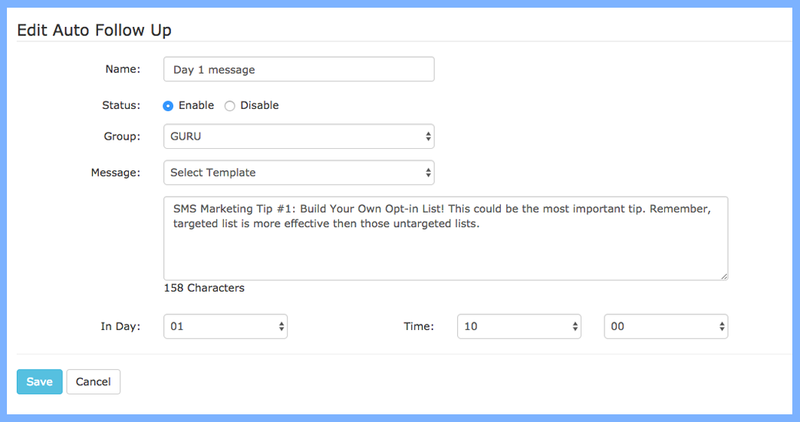 Day 1: SMS Marketing Tip #1: Build Your Own Opt-in List! This could be the most important tip. Remember, targeted list is more effective then those un-targeted lists. Day 2: SMS Marketing Tip #2: Create Powerful Offer! Each message goes out must be a strong offer to your customers. So they will response or even forward to friends. Day 3: SMS Marketing Tip #3: Send SMS Message At The Right Time! eg. Restaurant can send the SMS promotion just before the lunch hour or dinner time to draw a crowd. Day 5: SMS Marketing Tip #5: Link To Your Web Site! Put a web link in SMS message, so customer can find out more info on the web site, or even order online directly. Day 6: SMS Marketing Tip #6 : Keep Message Within 160 Characters! This will save you cost. If the message exceed 160 characters, you will be charged of 2 SMS. Day 7: SMS Marketing Tip #7: Integrate With Other Ad Channel! Use SMS as a call-for-action on newspaper ad, outdoor ad, website, facebook, flyers to build your list.